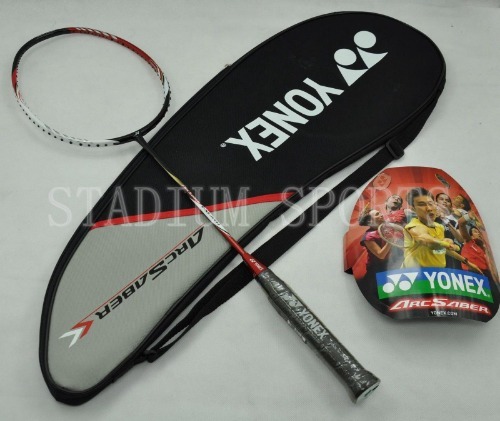 Yonex has created a badminton racquet to keep up with the ever increasing speed of the badminton game. By focusing on their flagship technologies Yonex has created the ArcSaber i-Slash (Arc IS), a new model allowing players with an aggressive playing style, to smash with the fastest swing speeds possible. The Yonex ArcSaber i-Slash (Arc IS) is the latest of a new generation of slim racquets that, just like professional athletes, carry no extra fat for the ultimate in performance. It is Yonex latest lean and powerful machine at an economical price. The "i-Slash" features three dimensions of technology to bring out a player™'s maximum potential. The Yonex Arc Saber technology has the latest and greatest technology to help its user achieve power, speed, and control. The ArcSaber Series of racquets utilize Yonex™'s exclusive Cup-Stack Carbon Nanotube technology to create a revolutionary blend of power and control. Positioned at the sides of the racquet frame, this revolutionary technology absorbs and harnesses energy from the shuttle™'s impact to provide the player with unparalleled feel during every shot. This energy is then transferred into a return of supreme strength and pinpoint accuracy.